Once again and as always, ISIS is saying something and you better believe it, and you better care because someone in the narrow mainstream media information bottleneck decided so. Actually I stand corrected, the ISIS psychological operation is so deep that in this latest episode of the ISIS psyop it isn't technically ISIS doing the talking but a group that sort of part of ISIS or sympathetic to ISIS. The distinction is not very clear and therein lies part of the psyop. An issue we'll discuss later. So while Russia, Syria and other allied forces continue to destroy ISIS by destroying their infrastructure and resources, simultaneously the U.S. western Intelligence and mainstream media continue to make ISIS seem as if they are alive and well. We've been saying this since the western media decided to roll out the ISIS psyop on Americans in 2014. The U.S. and its Intelligence apparatus simply cannot afford to let ISIS die out. This prospect would present a serious threat to the new world order agenda. 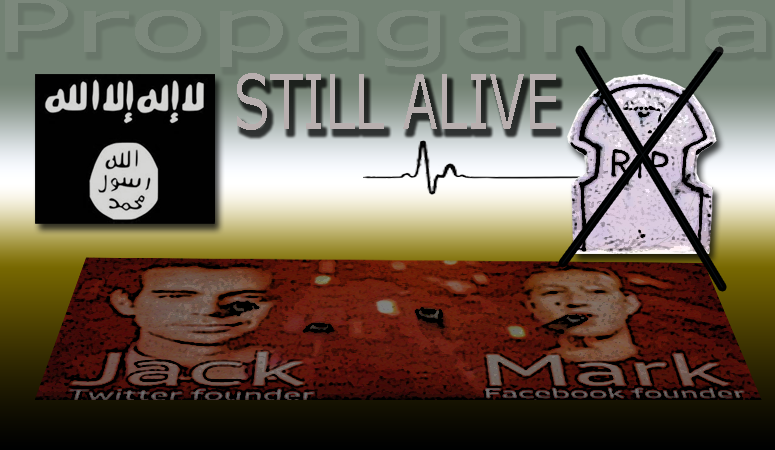 And as we can see, even as ISIS, the engineered Intelligence created proxy army designed to usher in the new world order on multiple levels, slowly dies out, the U.S. western mainstream media rolls out their second “ISIS is still alive” story in less than a week. It was just about a week ago when the Associate Press put out their ISIS financial report as if ISIS is a legitimate S&P 500 company whose stock holders need to follow carefully. In the recent report, we're told of ISIS resources inventory, currency use, budget cuts, even payroll issues. The average American should be insulted by these western media reports begging you to care about ISIS and their finances. If anyone reading this were to send a message today to Mark Zuckerberg at Facebook, even if it were a threat, I would safely bet a lot of money that your message will not make headline news or even be published anywhere. Whenever ISIS sneezes however, the western Intelligence and its mainstream media apparatus, who has a long history of ISIS worship and promotion, have proven time and time again that they will be there to cover promote and announce this sneeze or anything ISIS has to say in great details. And as ISIS continues to die out once again we're told by mainstream media to care what ISIS thinks. This time it's the opinion of a group called the “the sons of the Caliphate army” who we're told is somewhat part of ISIS, a point I want to focus on. Is anyone else noticing how the CIA backed western media continues to roll out group names, terms and concepts that always expand the concept of ISIS so as to give it eternal life? Whether it's the phrase “ISIS inspired”, ISIS “sympathizer”, ISIS “ideology” (which Obama has used) or whether it's groups quietly thrown into the mix in lieu of ISIS. In this case now it's the “sons of the Caliphate army”. Of course we are all familiar with their other names- Al Qaeda in Iraq, Al Nusra, moderate rebels, etc. So as ISIS continues to fade away let's not be surprised that we are slowly continuing to hear more about these previously hardly mentioned proxy groups with different names that up until recently were hardly ever mentioned. These secondary groups, names and phrases I believe are designed to make ISIS seem like they are everywhere. We saw that in the San Bernardino false flag shooting of December 2, 2015 when the shooter was retroactively decided to be “for ISIS” without ISIS actually being there. In this latest state propaganda the rhetoric, photoshop photos and all, for a change is delivered by someone other than Rita Katz and the SITE institute. This time it's “Vocativ deep web analysts on the social media service Telegram “. The message they have this time, that you're supposed to care about, is that ISIS is very angry at Facebook and Twitter because they have had too many accounts closed. So ISIS has a message for CEO's Mark Zuckerberg and Jack Dorsey and you better listen carefully. I ask readers to step back and try to see the cold, raw, tasteless and in-your-face style almost comedic propaganda technique. This time Vocativ does a great job of posting the classic wild wild west style propaganda of a photo with bullet holes. I believe the photo with the bullet holes is symbolic of the level of emotional manipulation the controllers assume their readers are susceptible to. Ultimately this recent ISIS propaganda, in addition to keeping the ISIS psyop alive as Russian forces and it's allies destroy ISIS, is intended to be used as a tool to justify internet censorship. We're being told that ISIS needs and loves Facebook and Twitter and that social media is a key to the success of ISIS so that the controllers can then make their case for why social media and the internet needs to be policed. That's what this entire story is all about. Without keeping ISIS alive this primary agenda could never go through. So let us not be fooled by this latest round of the ISIS show. And let's stay focused on where they are going with this. Anyone paying attention can see exactly what the agenda here is. The controllers want to censor and police the internet and they know they need to keep ISIS alive as a perfectly useful tool for this agenda. Sadly most Americans won't ever recognize the more obvious irony and oddity here. That an irrelevant hole in the wall (Intelligence created) proxy army gets dynamic marketing and explosive step by step and often day by day coverage of their activities from the western mainstream media. That this proxy army of unknown thugs, low-lives, and lesser intelligence rebel fighters is treated as and portrayed with super star celebrity status and whose every move and opinion you are told to care about. In today's world ISIS has proven to be a perfect tool to supply mainstream media filler stories. Got a few days with no false flag shootings? Need a filler story? Then spin a quick story about how ISIS is angry at Facebook and Twitter. Face it, ISIS is a saga that never ends. We've been given every angle of this story over the past year and a half. Even the fall of ISIS warriors has been announced and lamented by the western media. Do you care about Islamic State fighters, what they think, what they are doing and what they want? I don't and neither should you. Disconnect your mind once and for all from the ISIS psyop which was created to get you to accept the new world order. The globalist need ISIS and they know ISIS is fading away so we can look forward to more ISIS stories and, as mentioned earlier, new names being introduced like the “ the sons of the Caliphate army” to, if necessary, pick up where ISIS left off.